I've known about Kapparot – the custom of swinging a live chicken around one’s head, symbolically transferring one’s sins to the bird, who would then be killed - in a vague sense ever since my parents enrolled me in a Jewish day school years ago, but it wasn't until the eve of Yom Kippur 2016 that my eyes were opened to the utter cruelty of this practice. 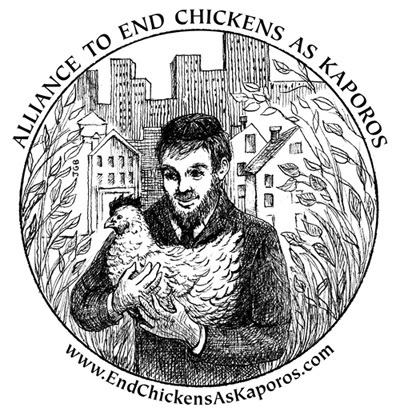 On Yom Kippur Eve, I received a frantic phone call informing me that crates of Kapparot chickens had been held for several days with no food or water by a local orthodox Jewish organization. This synagogue practices Kapparot every year. They keep the chickens in cages for days on end with nothing to drink or eat, and the "leftover" chickens who are not killed are then left to die in crates by the dumpster. How could this be happening in such a religious community, especially in the 21st Century? How can a religious leader enter into a 24-hour holy fast, which is a trial even for adults, knowing that there are animals sitting abandoned on his doorstep who have gone without nourishment for 72 hours or longer? Leaving them in a box, exposed to the elements, with no way to forage for food or seek shelter for an additional 24 hours – how could a religious leader do that to them? Ever since the industrial age, the business of meat production has become streamlined and mechanized and removed from the public eye. Meat, pre-packaged in shiny plastic on white Styrofoam trays in the grocery store, is purchased and consumed by people blissfully unaware of the horrors of the modern-day meat industry and the huge cost of volume farming on the animals. The chickens used in Kapparot come directly from factory farms. They are stuffed into transport crates - up to 16 chickens in each crate – and stacked 10, 12, or more crates high. They are held without food, water, or protection from the elements for up to 5 days before they are swung and then killed. Investigations into the practice have shown that , despite practitioners’ claims that their flesh is donated “to the poor,” the chickens are instead thrown into garbage bags or dumpsters, usually while still in their death throes. This practice is cruel, wasteful and unnecessary, and has remained controversial among Jewish scholars through the centuries. Many have argued that the ritual, while not mandatory at all, can and should be done using money, instead of chickens. The money can then be donated to charity. How is it possible to sway the minds of the few Orthodox sects that stubbornly hold on to the antiquated and cruel ritual and rigidly oppose change? The study of Torah and Talmud is built on interpretation, discussion, and insight, and thrives on differences of opinion that encourage debate and growth. There is no place for a bloodbath leading up to Yom Kippur, the holiest day of the year, a day when we should reflect on (rather than add to ) any unkind things we may have done throughout the year. There is no need for innocent animals to be tortured, starved, and abandoned to suffer a slow death. We need to work within the community to transcend these archaic relics of the Middles Ages and to, instead, promote kindness, benevolence, and compassion.